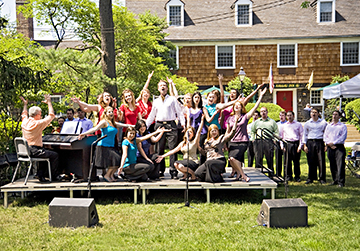 SINGING IN THE SQUARE: Opera NJ bringing the sound of music to Palmer Square, with tenor Neil Darling and the entire cast performing a number from Beautiful Girls. For more information and the summer schedule, visit www.opera-nj.org. Chief Anthony V. Federico of the Borough Police Department died suddenly on Sunday while on vacation at his summer home in Maine. He was 55. The cause of death is still unknown. Marvin Reed and Lee Solow of the Master Plan Subcommittee of the Regional Planning Board of Princeton presented a draft amendment to Borough Council last Tuesday outlining general principles for reducing expansion and encroachment of institutions, with specific guidelines directed toward Princeton University. A presentation by the principals involved in the Mountain Lakes Dam restoration project was the main event at last weeks Environmental Commission meeting. The non-profit environmental group Sustainable Princeton held a meeting last Thursday to focus on ways homeowner associations can encourage their residents to engage in greener practices. Since his current biography describes him as an assistant editor at Harpers Magazine, Christopher Beha, author of The Whole Five Feet, has, apparently, embraced a traditional lifestyle (or at least some semblance of one). Several years ago, however, his anxiety at the prospect of being an ordinary Joe led him to quit his regular job when he was on the brink of getting a promotion. Last March, the Princeton High School (PHS) boys basketball team produced an electrifying state tournament run that captured the imagination of the school and turned heads in local hoops circles.